There is a varicolored pattern in the middle of the screen with tiles randomly located around. Choose a color at the bottom panel and fill the pattern with one color! 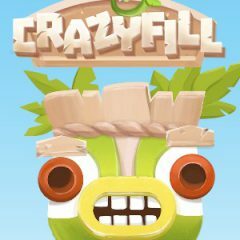 Crazyfill is a game where you have to paint the entire pattern one color. Do it step by step by choosing the best color for your next move. Watch all tiles around and see which color will cause maximum effect. The result won't take for too long. think of the best combination and match the criteria!